Happy Birthday National Park Service!!!! If you weren't already aware, today is the National Park Service's birthday. One-hundred years ago today, America had a great idea. And today, we are the beneficiaries of that idea with our Park Service and all that they do! --A 27-year-old La Grande man died Sunday in a climbing accident on the north side of Oregon's Indian Rock area. The accident claimed the life of Warren Lynn Webb, who died after his rope broke when he was 10 to 15 feet from the top of the rock he was climbing, according to Sgt. Nick Pallis of the Union County Sheriff’s Office. To read more, click here. --The 5Point Film Festival is coming to Bellingham from this evening thorough the 27th. In addition to all the films, there will be lots of other events going on around the Festival. 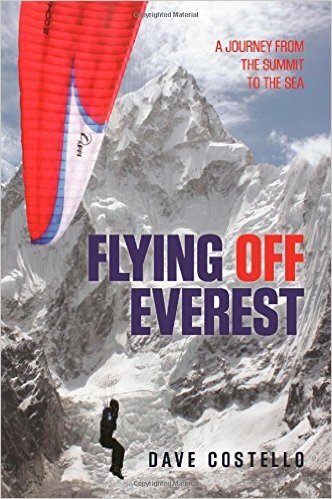 Authors Brendon Leonard (Sixty Meters to Anywhere), Ian Nicholson (Washington Pass Supertopo) and Dave Costello (Flying Off Everest) will all be making presentations at the event. AAI will be providing a self-rescue seminar at 1pm on the 27th. And there's a whole lot more! To see everything that's going on, check out the 5Point webpage! --State biologists spotted something unusual while counting mountain goats near Mount Baker earlier this summer: a group of 66 adults and 24 kids traveling together up a snow field. Aerial photos released by the Washington Department of Fish and Wildlife show 90 goats about 5 miles from Artist Point, on the northeastern side of the volcano. To read more, click here. --At the inception of the National Park Service, Stephen Mather, the Park Service’s first director, and park managers wanted to expand facilities to attract more visitors to its parks. Now in the Park Service’s centennial, many park managers no longer need to attract more visitors as they come in droves without coaxing and nowhere is this more true than at Zion National Park. As a result, park managers today face a much different problem than their counterparts of a century ago. The question they are trying to answer is how the park can ensure visitors get a quality experience in the midst of crowded conditions. To read more, click here. --Climbing magazine has published an awesome article about the rise of adaptive climbing. To check it out, click here. There are many parts to wilderness navigation, but four tools stand out as being the most important. First, a good topographical map. Second, a compass. Third, an altimeter. And fourth a GPS unit. Each of these items is a complex tool that takes a great deal of time and energy to use effectively. The following video, made by the owner of Midwest Mountaineering, Rod Johnson, is a brief overview of the components required for successful wilderness navigation. The map, the compass, the altimeter and the GPS must all be used in conjunction to one another. A climber should never depend solely on one of these items, but must practice using them as complimentary tools. There's a place where people party like it's 1999. There's a place where murderers use technical ice tools. And there's a place where people make really dumb mistakes in a really cold environment. And no, that place is not called Vertical Limit...but the ludicrocity certainly seems Vertical-Limit-like. No, instead, it is film called Whiteout. U.S. Marshall Carrie Stetko (Kate Beckinsale) is an isolated law enforcement officer. She works at a U.S. base in Antarctica. And she is a mere three days away from retirement when everything goes awry. There is a murder, the first murder on the continent. There is a wacko who wields an ice tool. There is a doddery old doctor (Tom Skerritt) who is far too easy to peg as being involved. And then there's the weather, which performs as a character in and of itself. The piece opens with a Soviet plane going down over the arctic. Somewhere on-board there is some kind of valuable cargo, cargo that someone from a U.S. Antarctic base would be willing to kill for fifty-years later. The rest of the movie is a somewhat fast-paced ride into the antarctic wilds as Carrie Steko peels back the layers in order to find the murderer. Unfortunately, the first time we meet Beckinsale's Steko, she is stripping down to take a shower. Apparently the filmmakers believe that the best way for an audience to take a female protagonist seriously is to get her to show some skin first. The filmmakers are, of course, wrong. An introduction to a strong female character like this is completely undercut by sexualizing her before we really get to know her. The film just goes downhill from there. We know who the killer is because there are so few characters. There are no real surprises throughout the entire piece. The story, which was originally a graphic novel by Greg Rucka and Steve Lieber, isn't too bad. Instead, it was the way that the story came together that made the entire experience bad. Brothers and writers Jon and Erich Hoeber and Chad and Carey W. Hayes, took the graphic novel and created clunky dialogue and completely ludicrous situations. Director Dominic Sena (Swordfish and Gone in Sixty Seconds) didn't help. Most of the shots in the film are like this. They look like they are all inside a studio. There was one wonderfully ludicrous sequence that took place as the arctic winds rose. The team engaged in a pitched battle with ice tools and handguns while clipped to fixed lines. The winds were so extreme that individuals not clipped to the lines would be blown out into the whiteout. It was odd that so many of the characters were so versatile in the action sequence wearing all of their "extreme" gear -- which in Kate Beckinsale's case, included a stylish fur-lined hat. And while they weren't moving like martial artists in the climactic scene, they were moving a lot more effectively than most mountain guides. If you're looking for a good suspenseful film about the cold places in the world, this isn't it. If you want to watch Antarctic schlock, check-out John Carpenter's classic The Thing. If you're looking for a great film about life in Antarctica, then try Werner Herzog's Encounters at the End of the World. It might be best to just avoid Whiteout. My last full day in Peru snuck right up! While I am sad to leave this beautiful country, I am comforted by the fact that when I get home to Bellingham, Washington, I will still be surrounded by the stunning mountains of the North Cascades. 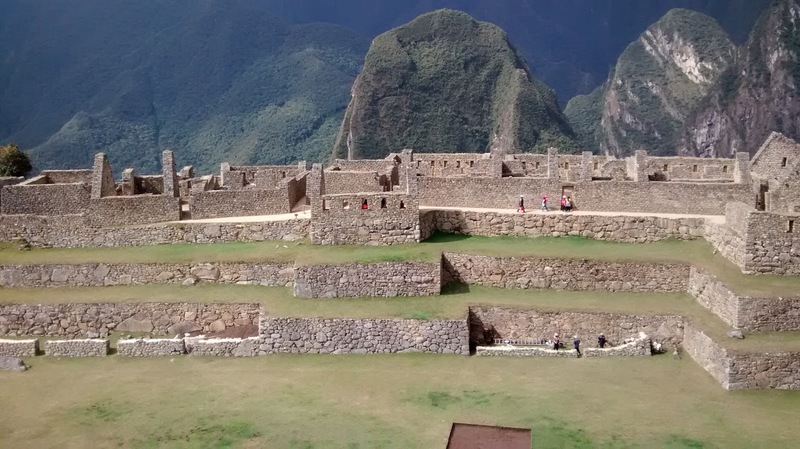 Also, what better way to spend my last day than to visit Machu Picchu! We woke up before the sun this morning to go stand in a huge line for the bus from Aguas Calientes to Machu Picchu. Our timing was pretty good though, because by the time we arrived at the ruins, the clouds were just starting to clear and a bright morning glow was beginning to illuminate the peaks surrounding the ruins. 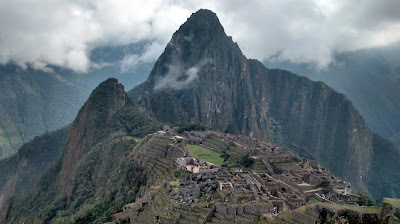 Our first view of Machu Picchu, just as the clouds started to clear. When we arrived at Machu Picchu, some of our group members had some important business to take care of. 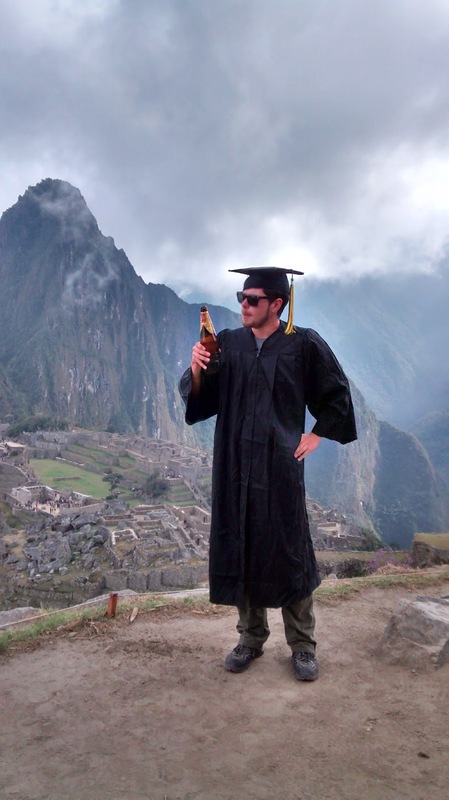 Since they are graduating this summer, they brought a cap and gown to take graduation pictures in front of Machu Picchu! One graduate even brought a bottle of local beer to celebrate the special occasion. with a Cusqueña beer and an awe-inspiring view. After taking lots of pictures of the complex ruins, it was time for a hike up Montaña Machu Picchu (also known as Huayna Picchu). We hadn't been hiking much since our research ended, so a long steep hike with killer views along the way was just what we needed. We were all so well acclimated that the hike felt easy, and our guide Luz said that we may have set a tourist record with our hiking time to the summit. a few days of resting in Huaraz and then in Cusco. 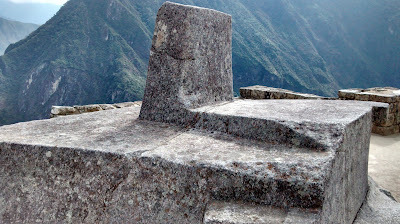 Next, we did a quick hike over to the ruins of the Sun Gate, which also has gorgeous views of the city of Machu Picchu. Finally, it was time to tour the city, and our guide Luz led us through the maze of ruins (and tourists), the whole time telling us a good history of the city and the Incan people who occupied it. She was also great about pointing out the best places to take photos! walls, like the three pictured here, contained candles for lighting. A temple inside the city with high-precision large stonework. as the season using shadows from the sun. that are within the city on this amazing mountain perch. After our climb and a thorough and repeated crisscrossing of the city, we were pretty tired and ready for dinner. Although one day felt too short to see such an incredible place, Luz did a great job showing us everything she could, and I don't feel like I missed anything. We had a full day in a truly unique and beautiful place. I have to say, it was also very enjoyable to eat a huge three-course dinner in a nice restaurant by the Urubamba River before heading back to Cusco by train and bus to pack and prepare for our flights back to the U.S..
Learning about the traditions and lives of the Inca people was a fitting way to end my research because of the great importance of nature in Inca culture. The Incas understood the vast importance of ecology and the ways in which humans both impact and are impacted by their surroundings. Peru’s natural environment is rich and varied, and many of its ecosystems are quite fragile. They reflect environmental change rapidly and those changes have major impacts on all the humans, plants animals, and microorganisms that compose the ecosystem. 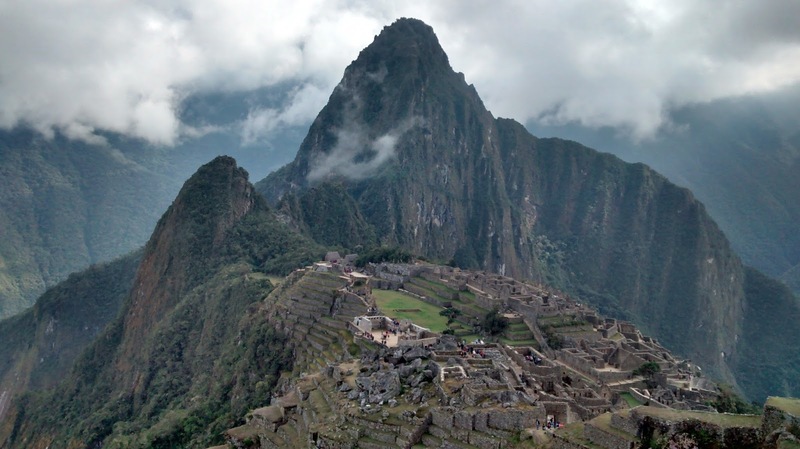 In Peru it is both important and relatively easy to study climate change. Our observations of the rapidity and severity of change in Peru's mountains makes it easy to understand the need and urgency of conservation and action on climate change. I hope to return to Peru and other Andean countries in the future, and I hope with all of my heart that the unique environments that I was so lucky to explore will still be there in a healthy and vibrant condition in the future. Until then, I will continue to explore and care for the North Cascades. Thanks for following my posts. I hope that they have inspired an interest in exploring some of the world's high mountain environments and an advocacy for climate change research and preservation efforts! We began our second day in Peru's Cusco area with a journey into the Sacred Valley of the Urubamba. This was an important agricultural area for the Incas and it remains so today for their descendants. 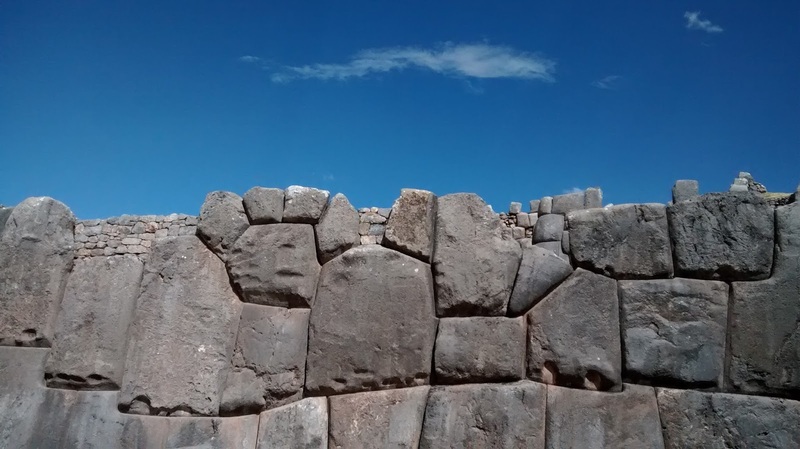 There are several roads in the valley including one that follows the river, but it ends at the Incan fortress (and current town) of Ollantaytambo. From there it was trails only to Machu Picchu which is down river, and today the great ruins can only be reached by high ridge trail or by the train line that now hugs the Urubamba. When we left Cuzco, we headed for the highland town Chinchero, which like all the settlements here, is populated by direct descendants of the Incas. While there has been much intermarriage with descendants of the Spanish in most of Peru's larger towns and its cities, here in the countryside, the people are of largely pure Chanca stock. The Chancas are first traced from about 1400, and it is known that they submitted peacefully to the rule of the Incas based in Cusco. A modern Chanca woman in her daily, traditional dress. Chinchero is home to stunning Incan ruins, and the town has numerous crafts people who produce high quality yarns and weavings. Our first stop there was a textile shop owned by middle-aged, local women who showed us how they clean, spin, and dye the sheep and alpaca "wools" that they then weave into beautiful textiles. Dyeing very fine alpaca yarn. We were impressed to see that the dyes they use are all natural and made from insects, lichen, and plants. They produce surprisingly vibrant blues, greens, reds, and purples of every shade. Their tools and supplies are of indigenous design and creation. Even the soap with which they clean the wool is natural, and in part comes from the root of a native plant. The natural dyes create remarkable colors. Next, we visited the Incan ruins in Chinchero. 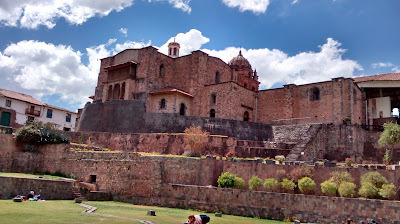 The ruins include the house of an Incan king, which Spanish conquistadors later turned into a church. It is now full of Spanish gold work and colorful frescos, but the impressive Incan stonework is still an integral part of the structure. Chinchero and throughout the Urubamba Valley. After a walk through the market to buy some handmade souvenirs, we headed back to the bus and stopped for a delicious buffet lunch of traditional Peruvian food. Next stop was the town of Ollantaytambo to visit the ruins of the Temple of the Sun. These ruins were much more crowded than the ones we visited previously, but they were perhaps more impressive since they were maintained so well. We went on a short but steep hike to the top of a hill where we had a beautiful view of the ruins and the town below. After exploring the ruins of Ollantaytambo, we hopped on a train and headed to Aguas Calientes, a settlement on the Urubamba below Machu Picchu. We're spending the night here at a little hotel. 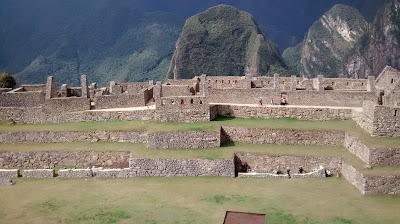 Early tomorrow morning we will visit Machu Picchu! We can't wait to spend the day there exploring what clearly appear to be - even in photos - an awe-inspiring creation. If the weather is clear, we'll go up very early for sunrise. Clouds have been coming and going, so we'll see. But regardless, we are all very excited about tomorrow. --A Portland man fell to his death Saturday at Dry Creek Falls south of Cascade Locks, the second such fatality in Hood River County in August. Rescue workers were on scene Saturday and Sunday, according to Hood River County Sheriff’s deputies. Samuel Shin, 28, was dead at the scene after falling about 50 feet onto rocks, suffering a massive head injury, according to Sgt. Pete Hughes. To read more, click here. --A 54-year-old hiker died after falling 150 yards on Mount Shasta Thursday. His 16-year-old son was rescued. According to a news release from Siskiyou County Sheriff's Office, the victim's son called 911 around 9:30 a.m. Thursday, reporting that his father, 54-year-old James Sieleman of Iowa, had fallen from the top of Red Banks. That's a geographic feature located approximately 12,800 feet up the steep slope of Mount Shasta. To read more, click here. --A 51 year old Portland man suffered a broken leg Sunday while climbing in the Dragontail Peak area near Aasgard Pass in the Alpine Lakes Wilderness. To read more, click here. --Idaho wildlife managers on Monday praised family members who charged a mountain lion and rescued a young girl from the jaws of the animal which was attempting to drag her off for the kill. The four-year-old girl suffered minor injuries from the attack Friday evening near a hot springs in eastern Idaho where dozens of relatives had gathered for a reunion, state wildlife officials said. The young male mountain lion believed to be behind the attack was later tracked and killed by authorities. To read more, click here. --Whatcom County’s most famous landmark, Mount Baker, celebrates two important anniversaries in August. On Aug. 11, 1911, Joe Galbraith won the first Mount Baker Marathon, a publicity stunt designed by civic boosters who wanted to attract people to the area. And on Aug. 17, 1868 a party lead by Edmund Coleman made the mountain's first ascent. To read more, click here. --He's notched more first ascents than any other American mountaineer, wrote the definitive guidebooks to a major North American mountain range, and at age 93, Fred Beckey is still plotting routes — though more slowly and buoyed by a cadre of fiercely protective partners. To read more, click here. --The body of missing hiker John Lee, a 68-year-old male from Mentone, CA, was spotted by helicopter in Sequoia National Park at the base of the southwest slope of Mt. Whitney (approximately 12,500 feet in elevation) on Sunday, July 24, 2016, at approximately 1:35 p.m. To read more, click here. --The death of a 56-year-old woman who was hiking in Joshua Tree National Park this weekend has prompted officials to warn visitors about the dangers of heat exposure as temperatures soar across Southern California. To read more, click here. Mt. Wilson in Red Rock Canyon in the morning sun. --Gypsum Resources is once again seeking Clark County’s permission to build a village containing thousands of homes atop Blue Diamond Hill. The company, which bought one of the nation’s oldest gypsum mines for $54 million in 2003, last sought to develop a scenic village across approximately 2,100 hilltop acres in 2011. But the effort stalled, and a previous concept plan’s approval expired amid talks of a potential land swap with the U.S. Bureau of Land Management. Those negotiations ended without a deal in 2014. BLM didn’t want lands affected by mining, which accounts for about 1,800 acres of the property, according to Gypsum Resources. To read more, click here. --It's not just entertainment on the Las Vegas Strip drawing people to southern Nevada anymore. Outdoor activities like rock climbing are bringing more people to the valley, according to an economic report just released. According to the article, Red Rock Rendezvous alone brings 1 million dollars to the local economy. To read more, click here. --On July 29, 2016 the Access Fund sent a letter to Congressmen Bishop (R, UT) and Chaffetz (R, UT), co-signed by Outdoor Industry Association and Outdoor Alliance, regarding the Utah Public Lands Initiative bill and the proposed Bears Ears National Monument. Access Fund determined the position through several years of efforts and after the entire Access Fund policy team spent 3 days in Utah meeting with local climbers and elected officials, discussing climbing management with Secretary Jewell and other land managers, and listening to the spectrum of concerns shared by local stakeholders including the Native American community. The letter states that we will continue to participate in the legislative process; however, we are also realistic about the current political landscape and we support the President's use of the Antiquities Act if there are no other options to achieve our vision for public land management in eastern Utah. See letter here. To read more, click here. --The race is on to win President Barack Obama’s attention as he puts some final touches on his environmental legacy. Conservation groups, American Indian tribes and federal lawmakers are urging his administration to preserve millions of acres as national monuments, including an embattled swath of federal land in northeast Clark County known as Gold Butte. Efforts also are underway in Utah, Arizona and elsewhere to get Obama to flex his presidential authority to set aside land under the 1906 Antiquities Act. To read more, click here. --A 36-year-old Lakewood man was rescued from the second flatiron near Boulder Tuesday morning after spending the night stranded on the rock. To read more, click here. --Search and rescue operations are expensive. However, a large percentage of SAR operations are done by volunteers. Those volunteers need equipment and training though. And those things cost money. An editorial in the Denver Post argues that backcountry travelers, both adventure recreationalists and outdoorsmen (hunters and fishers) should purchase a Colorado Outdoor Recreation Search and Rescue card for $3. Funds from these sales go to support Colorado's SAR community. To read more, click here. --Telluride ski resort will join the Mountain Collective for the 2016-17 ski season, adding to the growing family of ski areas allied to compete against Vail Resorts’ powerful Epic Pass. To read more, click here. --Alex Honnold doesn't have the same kind of brain that we do. This seems obvious to most of us who gawk at his free solo feats. But now science says his brain's not the same. To read more, click here. --There is a lot of excitement about climbing in the Olympics in 2020. But it's likely that the Olympic committee got it wrong. Athletes will have to compete in three events: sport climbing, bouldering, and speed climbing. The problem is that these events each play to specific skill-sets. Most climbers do not have a high level of ability in all three of these skill-sets. To read more, click here. A 19-year old climber on Trump Tower. --The Southeast Climbers Coalition and Access Fund are thrilled to announce that Denny Cove, a 685-acre parcel of land in eastern Tennessee, has been acquired and opened to climbing. This acquisition preserves a wild and undeveloped piece of the Fiery Gizzard area in the Southern Cumberland Plateau, and was made possible with critical support of The Land Trust for Tennessee (LTTN) and The Conservation Fund. To read more, click here. --Are you ready for mechanized vehicles on every wilderness trail in the United States? That’s what you’ll get if a deceptive piece of federal legislation becomes law. Portrayed as a “modest” proposal for mountain bike access, the legislation is a Trojan horse that would throw open all designated wilderness areas to bikes and prevent federal land managers from later excluding them. The “Human-Powered Travel in Wilderness Areas Act” was introduced into Congress by Utah Republican Sens. Orrin Hatch and Mike Lee, both known for their efforts to roll back environmental protection. You can read it online. To read more, click here. Now that our research expedition in Peru's Cordillera Blanca has ended, many of us took some time to have more of a vacation in Peru. Three other expedition members and I headed to Cusco on a trip organized by the Alpine Institute. We'll be here for three days – that will include a trip to Macchu Picchu, before flying home or continuing on other travels in South America. After a quick early morning flight from Lima to Cusco, we were met at the airport by our tour guide, Luz. She immediately helped us to feel welcome and well cared for, and after settling into our hotel, we set of on a walk around Cusco. Brief note about the hotel: After spending a month in the field and in cheap hostels, there is nothing like comfy hotel beds and clean bathrooms. We feel like we are living in Luxury! 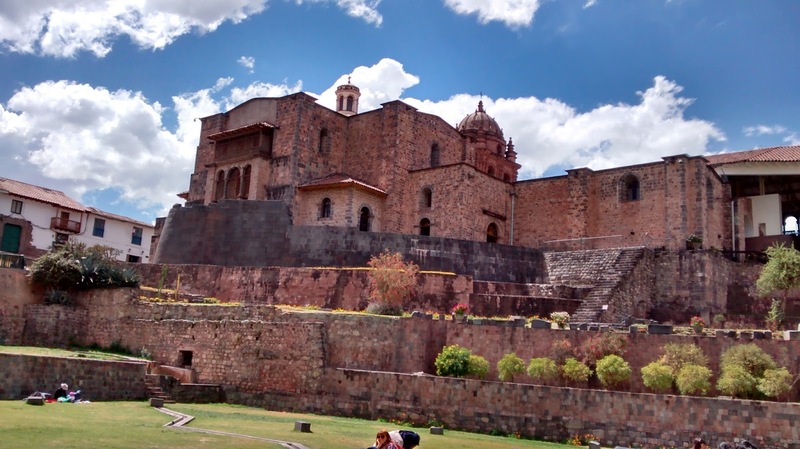 For our first look at Cusco, Luz took us on a walking tour where we visited the church in the Plaza de Armas and a museum with historical artificacts from Pre-Incan to Incan times. 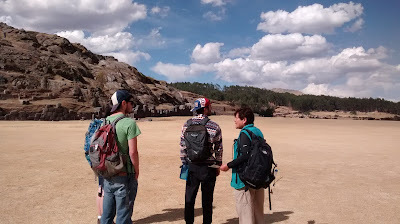 Luz's extensive knowledge about local history as well as the Quechua language provided us with a great history lesson! Our Cusco-four: Tylor, Nicole, Aaron, and me. We enjoyed walking through the narrow, cobbled streets of Cusco and looking at the ancient Incan architecture that still supports many buildings in the city. Since it was Sunday, we also got to enjoy the city's weekly Sunday parade. After a welcome lunch break (during which I tried Alpaca, which was quite good), we hopped in the bus to check out the Sacsaywaman ruins, including the main city, a military checkpoint, the water temple, and an archaeological temple. The Incan architecture of these places was extremely well-planned and complex, and Luz gave us some really interesting and helpful background information for each site. Luz giving us some history of the Sacsaywaman ruins. Perfect weather! 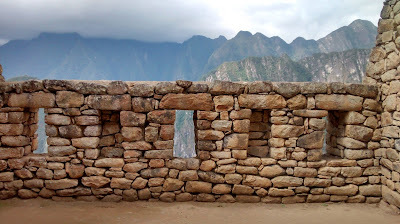 Incan architecture is awesome. See the puma print? Here I am in front of the incredibly complex Sacsaywaman ruins. Luz was great about always offering to take souvenir photos of us. Yes, I really was here! By the end of the day we were exhausted, but not too exhausted to check out the salsa dancing lessons at a local bar! It was a great day, and as much as we each enjoyed the Research Expedition, this day was a welcome change of pace after working at high altitude for three weeks. 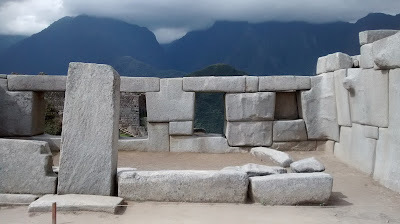 Tomorrow we head to the Sacred Valley and the day after to Machu Picchu, so more on that soon! 5Point/American Alpine Institute Self Rescue Clinic! At this year's event, AAI will be presenting a clinic on climbing self-rescue. The clinic will be designed for both mountaineers who want to brush up on their crevasse rescue skills as well as for multi-pitch rock climbers who wish to work on their high-angle rock rescue skills. The clinic will take place at 1pm on August 27th at the American Alpine Institute in Bellingham, Washington. Participants should RSVP for more information with Jason Martin (jason@alpineinstitute.com). This festival is a celebration of not just film, but of the arts that also celebrate outdoor adventure. Part of this years festival will be devoted to outdoor literature and outdoor authors. Each of the following three authors will provide a presentation at the festival for mountain minded people! When Brendan Leonard finished substance abuse treatment at age 23, he was lost. He knew what not to do—not drink alcohol and not get arrested again. But no one had told him what it was that he could do. He quickly realized that he had to reinvent himself, to find something other than alcohol and its social constructions to build his life around. A few years later, Brendan was sober and had completed a graduate degree in journalism, but he still felt he was treading water, searching for direction. Then his brother gave him a climbing rope. And along that sixty-meter lifeline, Brendan gradually found redemption in the crags of the American West. He became a climber, someone who learned to push past fear, to tough it out during long, grueling days in the mountains; someone who supported his partners, keeping them safe in dangerous situations and volatile environments; someone with confidence, purpose, and space to breathe. 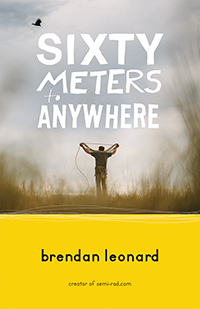 Sixty Meters to Anywhere is the painfully honest story of a life changed by climbing, and the sometimes nervous, sometimes nerve-wracking, and often awkward first years of recovery. In the mountains, Leonard ultimately finds a second chance. Ian Nicholson is one of those people who can never get enough of the mountains. He is so full of stoke that he's literally bursting with it. Ian is a professional mountain guide who operates primarily in the Cascades, but has experience in places like the Waddington Range, Patagonia and the Alaska Range. Ian's deep understanding of the North Cascades lead him to author the Washington Pass Supertopo guidebook. Washington Pass is one of the most spectacular places in Washington State and Ian's knowledge of the area is literally unsurpassed. Washington Pass Climbing is the most detailed climber’s guide to what is arguably the best alpine rock climbing area in the Northwest. The book includes 59 of the best routes in the area and Nicholson climbed and photographed every single one to ensure accuracy of the information. Nearly 20 of the routes have never before been covered with a published topo. Washington Pass Climbing includes formerly obscure climbs and variations of all grades to provide more options for avoiding crowds. Included routes feature everything from short 4th class scrambles to 5.13 big walls. While the book features many hard test pieces in the region, there is a generous selection of moderate multi-pitch climbs in the 5.6-5.10 range. Perched impossibly on a ridge overlooking a 10,000-foot drop into Tibet, Sano Babu Sunuwar and Lakpa Tsheri Sherpa wait. Heel to toe, connected at the waist by a pair of carabineers that's connected to nothing else, they stare down the North Face of Mount Everest, a red and white nylon tandem paragliding wing fluttering behind them. They know that jumping off the top of the world marks only the beginning of a longer, more audacious journey. And they know that the two-mile ride down Everest will be the easiest part. If the jump doesn't kill them. 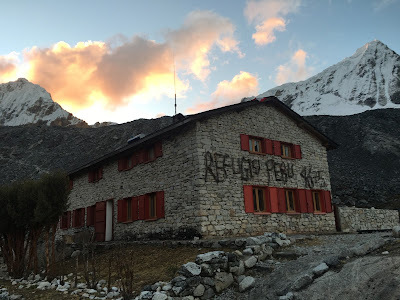 In April 2011 the two unsponsored Nepalis set out on an unprecedented expedition to climb Everest, paraglide from its peak, and paddle nearly 400 miles to the ocean. Little problems wouldn't stop them. Like the fact that Babu had no technical climbing experience. And that Lakpa had never been kayaking—or swimming. But after summiting, surviving their flight off the world's tallest mountain, and being arrested, robbed, and nearly drowned--repeatedly—the two friends discovered their adventure had only just begun. To see our review of this book, click here.